He's got the Midas touch. From being a mimicry artist, Lal (not to be confused with Mohanlal) has come a long way in his life and career as a scenarist, director, actor, producer, distributor and studio owner. Right now, the third part of the Harihar Nagar series -- In Ghost House Inn -- which he has written and directed, is setting the screens on fire. 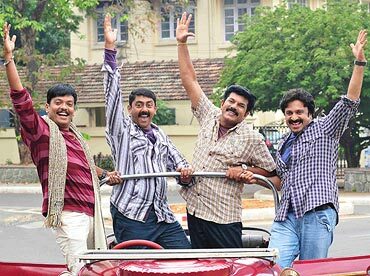 The four friends from Harihar Nagar, Mahadevan (Mukesh), Govindan Kutty (Siddique), Thomas Kutty (Asokan) and Appu Kuttan (Jagadeesh), can make the viewers smile just with their presence. Lal has mixed a lethal combination of horror and comedy in his latest Malayalam offering, In Ghost House Inn. At the location of Amal Neerad's Anwar, in which he is playing a character called Babu Sait, Lal looks relaxed and happy. In an exclusive interview with rediff.com, Lal talks about In Ghost House Inn and more. You've just made In Ghost House Inn. How did you feel to face the camera as an actor soon after? [Smiles] Acting was lots of tension initially, but by now I am more relaxed. I just have to get into the shoes of the character and here, I have a different get up and costumes, which makes it easier. You have combined horror and comedy. How did you decide on that? The characters, their nature and mannerisms in the Harihar Nagar series are known to all. So we had thought about introducing an altogether different environment for the story. Of course, horror and comedy makes a great combination, but it is a risky one as well. We have considered it all before we started making the film and it seems to have worked well, gauging by the fantastic response. The flashback scene in the beginning of the story gets the viewers into a different mood. Was it done with that intention? In the second part, 2 Harihar Nagar, the childhood scene was the foundation for the whole story. This time, the flashback scene set the right mood for the story. There are no women running around in white saris and the formulaic situations. Instead here is a foreigner in a haunted bungalow. The viewers are expecting the four protagonists to arrive, but what they see is a flashback scene. Now, the viewers had to accept it and then that was the risky part here! The viewers are aware about the nature of the four main characters. Will that make you tense, as people expect them to respond to situations in their own branded styles? True, expectations are high when such films are attempted. The third part will have to be different compared to the earlier ones. And if the viewer feels it was almost like the early film, it can work against the movie. Wasn't balancing horror and comedy difficult? Though it is difficult for me to explain how I balanced horror and comedy, I have tried to maintain a certain mood. It tends to change at times and things become more interesting then. How different have things like filmmaking and marketing changed ever since the first film of the series, In Harihar Nagar, which was made almost two decades back? There have been tremendous developments regarding the technical aspects. Even a crane was regarded as a luxury when we started making films and we used one for the first time while making Godfather. Now we have the latest films, cameras, equipments and even things like spot-editing. Marketing In Ghost House Inn has been comparatively easy as the earlier films are the publicity materials for the latest one. Have you been asked about the fourth part already? Of course, but I haven't started thinking about it seriously. Anyway, it's a great feeling coming together for the making of this film. Do you want to come out of this mould and direct a completely different film now, based on a new story with different characters? There hasn't been any story that has fascinated me right now. The moment I get one, I will start thinking about it and plan my next film.